German audio specialists Teufel has explained its decision to get into the headphone market after 30 years of concentrating on speakers. Teufel, whose products are only available through phone orders or online, has concentrated primarily on its speakers since its launch in 1979, but is now selling headphones, with TechRadar getting a pair of its AC 9050 PH cans. "People were asking for them," explained Managing Engineer Christoph Winklmeier. "On our forums and telephone lines people were asking for a Teufel product or a recommendation, so we made this decision." Teufel's Marketing man Florian Szigat thinks there is a simple reason for these questions. "Our customers trust us," he adds. "Our core competence is with speakers, but when you go through the forums you see that this is a market that our customers are newly interested in." 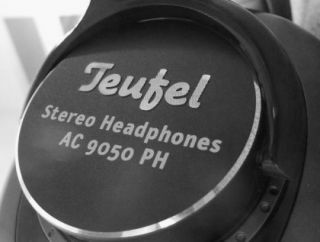 The headphones are not developed or manufactured by Teufel themselves, with Winklmeier confirming that the company was sourcing the cans from an OEM (original equipment manufacturer). "They are not self-developed and they are not self-produced," he added. Teufel's focus on multimedia speakers and the burgeoning gaming market will also extend through to headsets, with not only Dolby headphones on the horizon, but also a headset.